From Joanna Trollope, one of the most insightful chroniclers of family life writing fiction today, comes a contemporary retelling of Sense and Sensibility, Jane Austen’s classic novel of love, money, and two very different sisters. John Dashwood promised his dying father that he would take care of his half sisters. But his wife, Fanny, has no desire to share their newly inherited estate. When she descends upon Norland Park, the three Dashwood girls—Elinor, Marianne, and Margaret—are faced with the realities of a cold world and the cruelties of life without their father, their home, or their money. Reimagining Sense and Sensibility in a fresh, modern new light, she spins the novel’s romance, bonnets, and betrothals into a wonderfully witty coming-of-age story about the stuff that really makes the world go around. For when it comes to money, some things never change…. Someone somewhere got a wild idea to get best-selling authors to “officially” rewrite Jane Austen’s major novels for a twenty-first century audience. Well, OK…Austen sequels, rewrites, updates, variations, and etc. have been an industry for years. So sure, a few more won’t hurt. The series started with Sense & Sensibility by Joanna Trollope, continued with Northanger Abbey by Val McDermid (reviewed briefly on Goodreads), Emma by Alexander McCall Smith, and Pride and Prejudice by Curtis Sittenfeld should be coming out in 2015 (I don’t have a US release date for that). I decided I’d at least give the re-tellings a try. 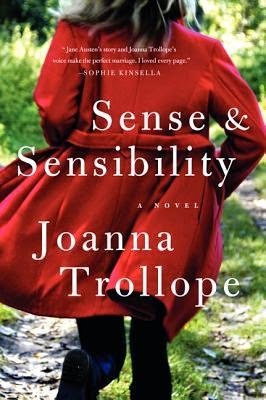 Sense & Sensibility as told by Joanna Trollope is a perfectly every-day novel. I’ve never read any of Joanna Trollope’s novels so I can’t compare to her usual style but S&S is adequate. The sentence-level writing reads well and some of the plot updates (Marianne’s illness, Brandon’s military experience, the Ferrars obsession with money) work very well. However, however…I was immediately put off by a change in Edward Ferrars’s backstory and never got back on an even keel. He is changed from a diffident, but upstanding young man interested in entering the Church to a vague, unfocused drifter who was sent to school in Plymouth after being expelled from Eton for being the lookout man in a drug ring. Mrs. Jennings and Charlotte Palmer (among others) no longer just seem self-centered and silly. Their teasing of Marianne reaches a level of mean-spiritedness that I didn’t think possible. In the scene where Marianne sees Willoughby in London – at a wedding reception that Charlotte has managed to “get them invited to” instead of a ball – the whole thing is recorded and put on YouTube (of course). Charlotte shows up at her mother’s house and insists on playing the video over and over for Eleanor and commenting almost gleefully about what happened. There is a lack of authorial distance in this book – Austen uses the distance for ironic commentary in the original novel that is lacking in this re-telling and it makes the characters’ actions simply nasty. And then there is the same complaint that I had with Val McDermid’s Northanger Abbey – the plot is in lockstep with the original. There are absolutely no deviations, nothing allowed to develop organically to better fit with the modern time period. As a result the story begins to feel clunky and boring. Does Fanny immediately start redecorating Norland? Yes. Does Marianne like music and Eleanor drawing? Yes. Does Brandon immediately fall in love with Marianne? Yes. Does Marianne get caught in the rain, requiring dramatic rescue by Willoughby? Of course. Does Willoughby give Marianne an expensive gift? This time it’s a car. Is Brandon called away right before a picnic allowing Marianne and Willoughby to sneak off to Allenham? Yep. Is Lucy Steele out to marry money and almost sunk by the loose lips of her idiot sister? Yep (and the sister is actually one of the most annoying and least believable characters ever written). Does Mrs. Ferrars bang on about some Morton girl marrying Edward? Yes. Does it all work out in the end including forgiveness for everyone? Yes, yes, yes. In short, the Austen Project novels, so far, seem to be best suited for those readers who are unfamiliar with Austen’s original novels. Which I find to be galling because there is nothing wrong with the original novels and they can be read by academics and plebeians alike. Meaning, if you are as familiar with the original novels as I am you are going to be just as bored and underwhelmed. If one wants to re-tell a familiar story and update it for a contemporary audience there are so many successful adaptations: Clueless, Bridget Jones’s Diary, The Three Weissmanns of Westport, The Lizzie Bennet Diaries. Each of those took the original story and concept and adapted the concept to fit the time period rather than bend the time period to fit the idiosyncrasies of the plot. I’ll probably give the McCall Smith Emma adaptation a shot but if that’s as underwhelming as Sense & Sensibility and Northanger Abbey then I might bail at fifty percent. Dear FTC: I received a finished review copy from the publisher. 1. 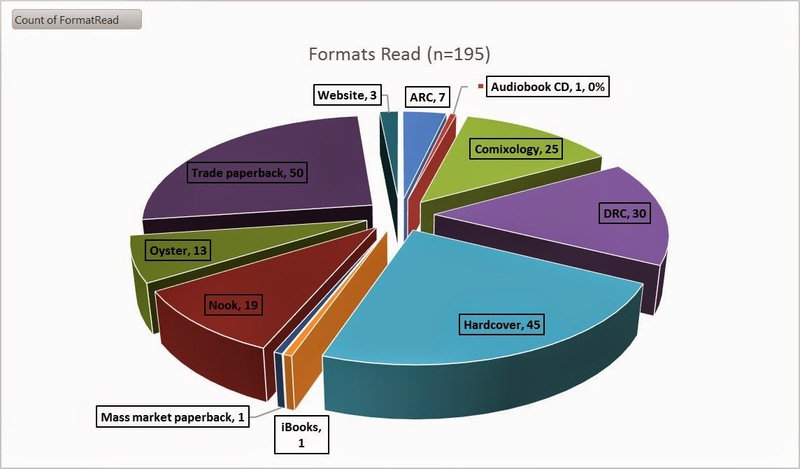 Be mindful in my reading and bookish purchases – I did really good on this in the second half of the year and really made good use of my library cards (I finally got signed up at ICPL and NL) and my Oyster subscription. 2. Be timely on reviews – I think this was kind of a fail. 3. Drink more water – also kind of a fail. 4. Move more (the Fitbit is helping, but I need to be better at going to the gym) – I was diagnosed with a probable tear in the cartilage in one hip and the gym going was really limited. 5. Cook for myself – I really limited my fast food consumption this year and started remembering to make my own coffee in the morning which helped with the mocha/latte consumption. 6. Be brave – I visited Rebecca of Book Riot when I went to Virginia for the AXS biennial Conclave (and met Amanda, too), I started a YouTube channel, and I also made sure to make use of the new FilmScene art-house movie theatre. 7. Take a vacation – I visited Washington DC with my parents and, of course, stopped by Politics & Prose in Georgetown. So, overall, I think I did pretty good with my resolutions this year. 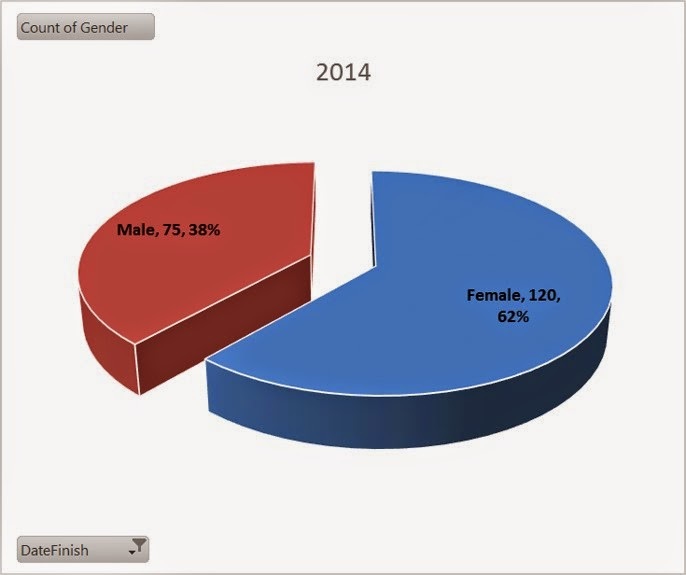 Now, what about those pie charts I promised…. It’s taken me a few weeks to wrangle my book database but I did! And I have stats! This year I used the .csv file generated from Goodreads to build the backbone of my book database in Access (I have an analytics background and am teaching myself SQL so this was several hours of merrily wallowing in code and Google searches and spreadsheets back in February/March). 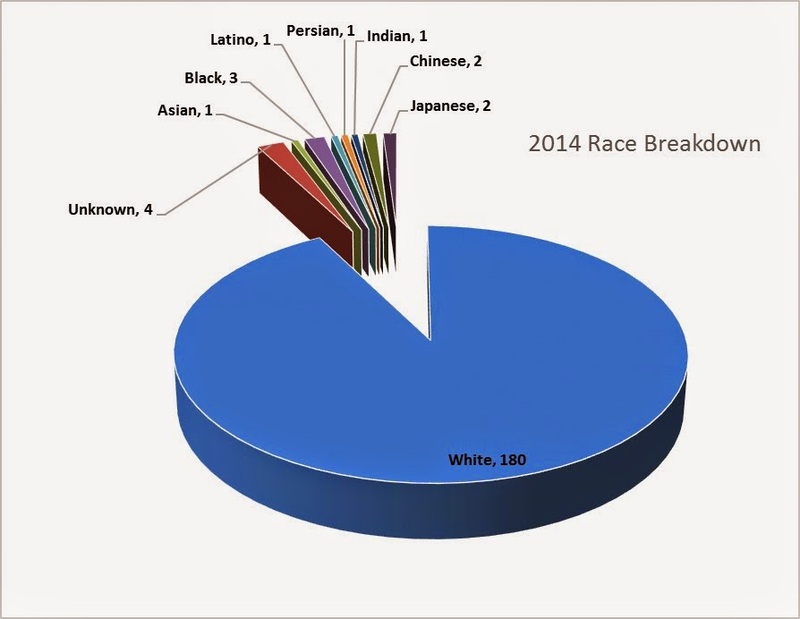 I’ve been tracking genre, format, gender, nationality, and race this year and I have a little historical data, too. To start, I smashed my Goodreads goal of 130 books by reading 195 books. BOOM. (Yes, I counted comic books as “books” – who cares?) Some of my favorite books this year were Jenny Offill’s Dept of Speculation, Ruth Ozeki’s A Tale for the Time Being, Jeff VanderMeer’s Annihilation, Celeste Ng’s Everything I Never Told You, Leslie Jamison’s The Empathy Exams, Roxane Gay’s Bad Feminist, Sarah MacLean’s Never Judge a Lady by Her Cover, G. Willow Wilson’s/Adrian Alphona’s Ms. Marvel, Brian K. Vaughan’s/Fiona Staples’s Saga, and Eloisa James’s Three Weeks with Lady X. And those are just the ones I can remember off the top of my head! 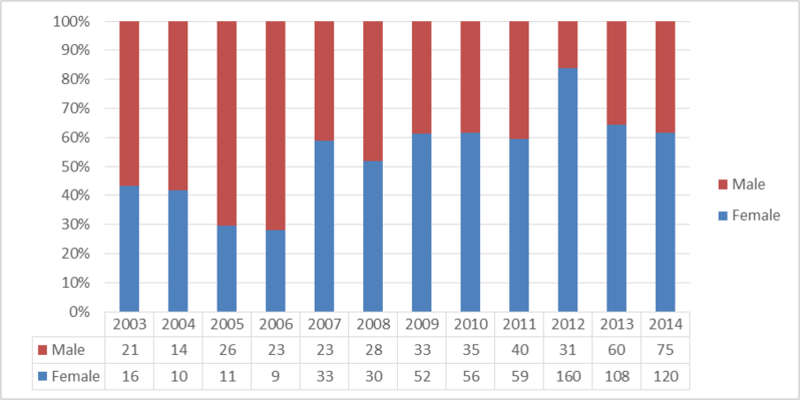 The 60/40 split has been pretty steady for a number of years, with the exception of 2012 because romance novels were almost the only thing I could handle reading when my mom was being treated for cancer (a guaranteed happy ending can go a long way…). 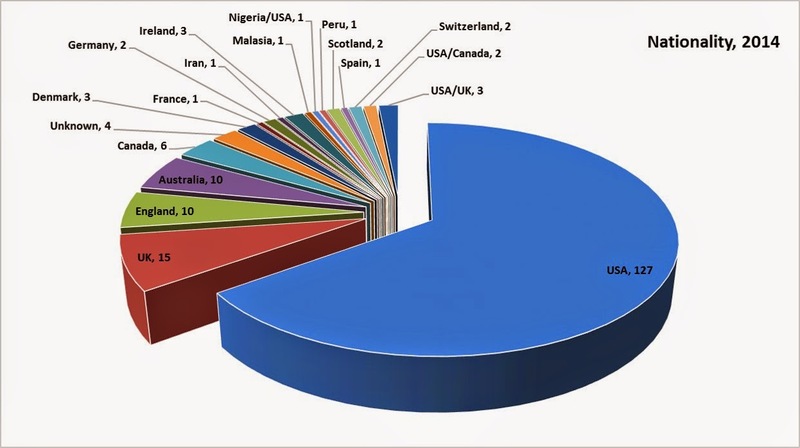 (and I’m super-sorry about spelling Malaysia wrong – it’s corrected in the database now so should be correct next time I do this). And what about race/POC? 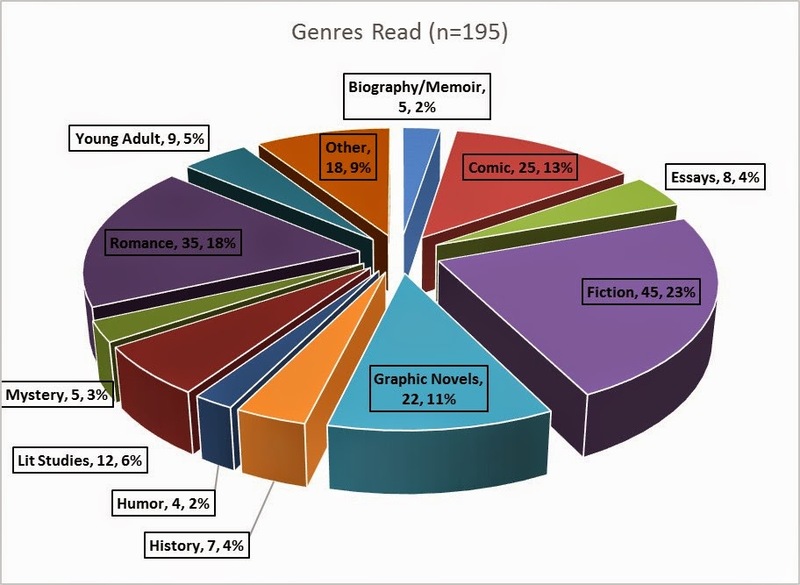 The issue of reading diversely was huge this year in the book community, particularly on the bookternet. Yeah, not so good. 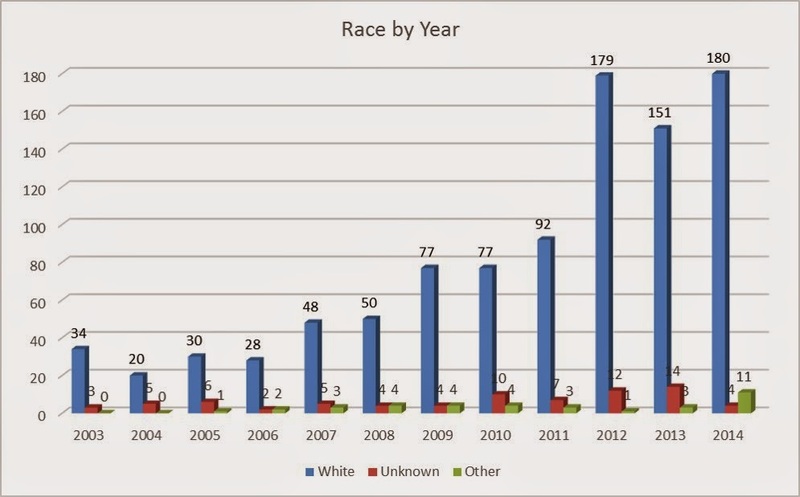 I read more POC authors overall, but since I read more books in general the percentage of POC authors I read didn’t go up. 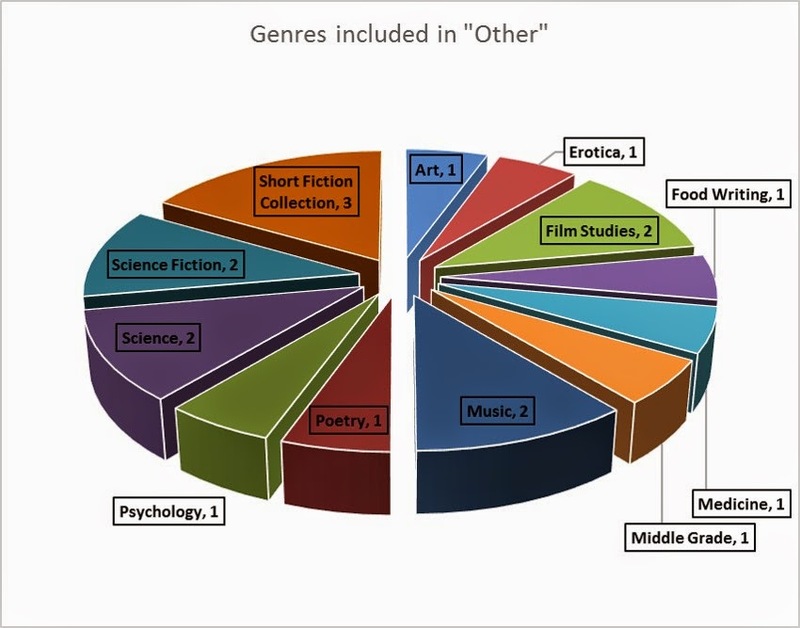 (I deliberately didn’t make the denominator discrete “authors” but counted each book individually in these stats – if I read 7 books by the same author, and that author happens to be white, that should be counted the same as if I read 7 books from 7 different white authors). So the takeaway here is that I get an A+ in reading but a D- in diversity. Diversity is one of my big, huge goals for 2015. I am going to be more mindful about reading authors of color (i.e. not-white) and authors in translation which (in theory) might help with reading more POC authors. I was really struck by Ann Morgan’s blog A Year of Reading the World – she spent 2012 reading one book from each country on Earth (about 196 books total) – and now has a book coming out where she expands on themes and issues she encountered while trying to locate and read more books by non-UK/Commonwealth writers. Reading the World will be published in the UK on February 5 and in the US as The World Between Two Covers in May. I have a galley and am so excited and honored to have received one. I’m also participating in the Goodreads Seasonal Reading Challenge group and the Book Riot Read Harder Challenge – a number of these tasks require reading non-white, non-US/Anglophone literature – so that will also help me keep my reading goal. 1. 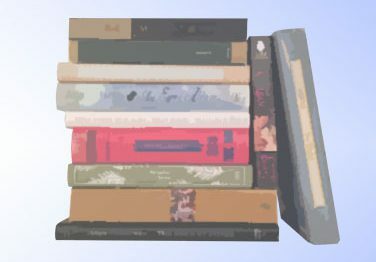 Be mindful in my reading and bookish purchases – keeping this up will help so much with financial responsibility and the general amount of excess stuff in my house that I will never get around to reading/liking/re-reading. 2. Be timely on reviews – such a big deal, especially for books that I have requested as a reviewer (I know that there has been a lot of discussion in the book blogging community about what is “owed” to a publisher but, in my opinion, if a publicist, etc. has taken the time to send me an ARC or DRC then I should return the gesture by reading and reviewing the book in a timely manner). 3. Drink more water – do I need to drink as much Dt. Pepsi as I do? No. Although, #deathbeforedecaf is still a mantra (you cannot separate me from my coffee). 4. Move more – the hip (and knees and back) and I have come to an agreement on ways of moving so I should be able to at least get on the elliptical and basic weights at the gym. 5. Cook for myself – I got a Dutch oven and new pots and pans for Christmas so this year the goal is to wean myself off of frozen dinners for 2/3 of my meals (they are handy, but my MSG-sensitivity is much less of an issue if I cook food for myself). 8. Relax – cf. resolution #7. And that’s it! Bring it, 2015! You can see me holding my iPad up to the camera (and get a serious close-up of my face) in my BookTube video for my 2014 wrap-up – same thing as here, just more visual. From “a top-notch emerging writer with a crisp and often poetic voice and wily, intelligent humor” (The Boston Globe): a collection of stories that explores the lives of talented, gutsy women throughout history. The fascinating lives of the characters in Almost Famous Women have mostly been forgotten, but their stories are burning to be told. Now Megan Mayhew Bergman, author of Birds of a Lesser Paradise, resurrects these women, lets them live in the reader’s imagination, so we can explore their difficult choices. Nearly every story in this dazzling collection is based on a woman who attained some celebrity—she raced speed boats or was a conjoined twin in show business; a reclusive painter of renown; a member of the first all-female, integrated swing band. We see Lord Byron’s illegitimate daughter, Allegra; Oscar Wilde’s troubled niece, Dolly; West With the Night author Beryl Markham; Edna St. Vincent Millay’s sister, Norma. These extraordinary stories travel the world, explore the past (and delve into the future), and portray fiercely independent women defined by their acts of bravery, creative impulses, and sometimes reckless decisions. The world hasn’t always been kind to unusual women, but through Megan Mayhew Bergman’s alluring depictions they finally receive the attention they deserve. Almost Famous Women is a gorgeous collection from an “accomplished writer of short fiction” (Booklist). 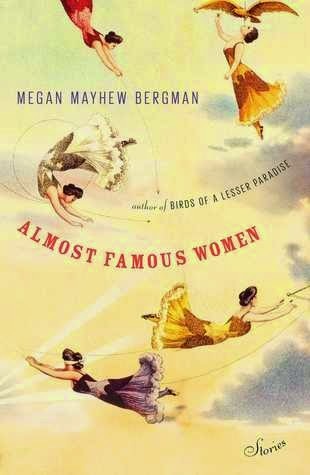 For my first book in 2015, I chose Almost Famous Women by Megan Mayhew Bergman, author of the much-lauded (though still lurking in my TBR pile) Birds of a Lesser Paradise (I did, however, read the title story in a Best American Short Stories volume). This short volume contains an amazing collection of short stories about women who were fame-adjacent – Oscar Wilde’s niece, Edna St. Vincent Millay’s sister, James Joyce’s daughter, Byron’s daughter – or briefly famous – Beryl Markham, the Hilton twins, actress Butterfly McQueen, the women of the International Sweethearts, or the women liberated from the Bergen-Belsen concentration camp (this story shows off a beautifully realized first-person plural narration). Bergman, with just a few sentences, creates vibrant portraits of the women that fame briefly elevates, chews up, and spits back out. None of them have easy lives, either in reality or in the inner-life that Bergman imagines for them. Absolutely stellar writing. This is very short collection, so I hesitate to suggest that a story be removed, but as good as “The Lottery, Redux” is, it just does not fit with the other stories, in my opinion. While all the other stories revolve around a real-life historical figure, “The Lottery, Redux” tangentially relates to the collection via the creation of a famous woman; The Lottery by Shirley Jackson. It is a wonderfully crafted story but it doesn’t fit together with the other stories as they all relate to one another. It’s the last story in the collection, so it doesn’t interrupt the flow of the stories. But still such a great story. I’d definitely recommend this for those looking for good short story collections. Almost Famous Women is out today, January 6, from Scribner!